How to manage overwhelm with one quick exercise. I have been feeling overwhelmed lately. My clients feel overwhelmed too. That is one reason why they have a coach. This past Monday I had to take some time to decompress and think about my work, projects, and clients. I know that overwhelm is an emotion that pulls energy away from me being my best leader. I decided to do what I call “The Overwhelm Time Bubble” exercise. This is a simple tool I use with my clients…and this time I did it for myself. I wanted to get a clearer idea of all the work that I must do. Today, I am sharing with you this simple — no-cost — exercise to help you manage overwhelm. In this video, you will get a view of what I face to grow my business, and you can walk along with me using “The Overwhelm Time Bubble” exercise. Hi, this is Gene with Leaders in the Trenches, and my big question today is have you ever felt overwhelmed? Well, the kind of overwhelm I’m talking about is the pressure that comes when you know that there’s more work to do than you have time to do it, and you haven’t activated your team around all of the pieces that are necessary for the business to grow without you, you don’t have a self-managing company, if you will. Now I wanna let you in on a little secret that you may or may not know about me, but I do feel overwhelmed sometimes. I have a lot of projects going on. I’m going to share with you an exercise that will help you understand and map out some things and help you make some strong decisions around how to move forward. Hi, my name’s Gene Hammett, I work with hypergrowth companies, companies that want to grow fast and leaders of those companies that really wanna understand their people so that they are activated at a deeper level, and that they can create the right strategies for growth. So today I’m talking about overwhelm. And to be honest with you, this Monday I felt overwhelmed. I have a lot of projects going on. I was out of town all week in Vegas for an event, and I didn’t get much done. I had planned to do a lot of things, but I had a lot of extracurricular things to meet, meetings and people to meet, and happy hours and things like that. I was even bed by eight, which I feel kind of embarrassed to tell you that I was in Vegas, and I was asleep by eight. Well, I wasn’t asleep, but I was showered and in bed resting. I wasn’t out at the clubs. But that being said, I came back this week, Monday, just feeling the pressure of I need some space. Well, I took that space. I took the time for me to decompress and just let go of some of the things that were going on. And my mind kept working on it. I was having trouble sleeping. And all of the pressure of things going on, so I understand what it’s like for you as a leader who has a team, who has big goals, who wants to increase your revenue, wants to improve your level of service to your clients, wants to reach new people, wants to do all of these things. I feel it, too, in my business. I have a small team. I love my team, Mary and Jenn and Amanda, and Tenille. You know we have a, just a fun time together building out this business, but it is work. So what do you do when you feel overwhelm? Well, one of the things that I’m gonna introduce to you, I call this the time bubble chart. So I’m gonna ask you to create what I created here. You may not be able to see this very well, but it really is a simple chart, and I want you to do a couple of things to it. But let me describe to you what this chart will do for you. It will give you a very real picture of where you’re spending your time, the projects you’re working on, the things that pull energy away from you, some things that give you energy, some things that make you money, some things that don’t make you money. But you’ll be able to lay them out on one piece of paper, and it’s meant to be a simple look at what you have going on, but also to give you some reality check to how do you wanna move forward. So my suggestion is put yourself in the center of this if you’re the leader of your company if you’re a leader of your team. And then write the circles and put big projects in each of those circles. So for me, I have a speaking business, right, so I’m out speaking all the time, I was in Vegas last week. I’m speaking probably somewhere between 20 and 30 times a year, and that’s great. I also have a coaching business. I coach people. So I have that part of the business. I write for Inc. magazine, so there’s a third project. I have taxes that have to be done. That’s a project that really I have to be involved with. My team has taken it as far as they can take it. And now I have to make some final decisions and work with my accounting team to get those things done, so that’s a project that’s really up to me. I have that, I can mention the podcast and the articles, so what I end up doing is building a piece of paper that looks a lot like this. I’m in the center. I put myself in a square box. You can do any shape that you prefer. But I put bubbles around that for the different projects. Now what I’m gonna ask that you do is go into this and circle the ones, I’m using green, that makes you money. So I am circling these that make me money. So I just did that right now. So I have four boxes that make me money in my business. My speaking makes me money. My coaching makes me money. And that is a big part of my business, advising high growth companies and leaders to grow. Some of those little exercises, this is one of the little exercises that I may use. Articles that I write for Inc. magazine, I do get paid. It’s not a lot, but it is something I get paid on, and it’s growing over time, so that’s fun. My podcast actually generates money from sponsorship, and if you’re interested in that, then we can talk about it. But you wanna know what’s making you money. You also wanna have another color around which ones are actually supported by others. 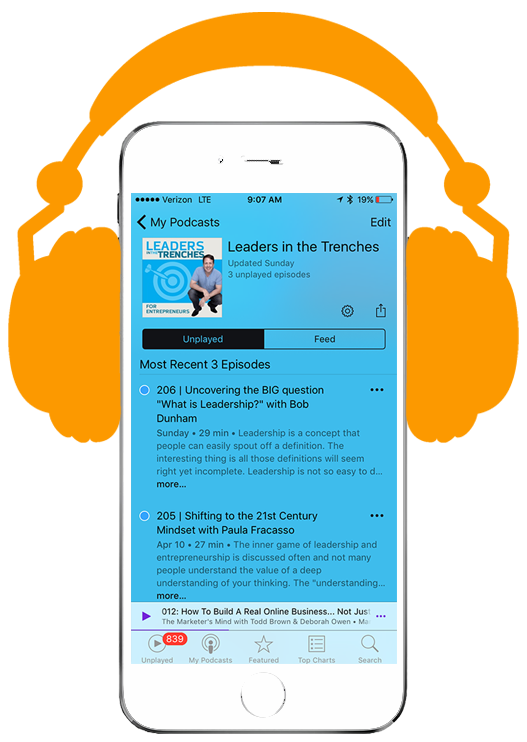 So I have two of these specifically in blue that are supported, the podcast, Leaders in the Trenches podcast and my articles. I have people on my team that help me produce those each and every week. I have an editor on my writing team and helps me understand articles and get those things done, I’m actually meeting with her today. And then I have Mary on my team, who will take this video, edit it, get it ready for the podcast, get it ready for YouTube, get it ready for social media, all of the things that go on. So I do have some support. But what I’m noticing here is there’s not a lot of support in the other areas of my business. I have no support in my coaching business because it’s just me. You don’t get a program coach or some junior coach, you get me when you work with me. So my speaking, it’s just me. I’m the one that does the bookings. I’m the one that does the speeches, you know, no surprise there. But you wanna look at what’s going on in your life. You wanna be able to identify the things that only you can do and the things that your team can do and see if you can activate them at a higher level. When I was doing this, I put on here all the projects and all the work that I have in my mind, and I realized a few different decisions I have to make. One of them, I can’t go on like it is. If I’m feeling overwhelm, I can’t go on. And you can’t go on, either. You’ve gotta either give up something, right, you’ve gotta let go of something and not do it anymore. That could mean delegating, that could mean hiring someone, hiring a contractor. Those are big decisions you have to make. Or it could mean you absolutely just stop doing it. There’s a few things in my business I’ve stopped doing. I won’t go through those today, but you know, there’s an emotional drain to doing something that’s not really paying off, not really moving the needle. You feel like you’re doing it because you have to, or you’ve always done it. And it’s, you don’t wanna give it up. You don’t, you know I’ve never met a leader who said I wanna give this up. I know it happens from time to time or finally, maybe it happens because you get to a breaking point. Well, there’s one decision you have to make is what do you want to give up to get to where you’re going? The second decision you have to make is who do you give it to if you’re gonna keep it? Who do you, who on your team is going to pick up the pieces? Who is reviewing the code if you’re a coder? Or who is going to review the social media campaigns? Or who is going to review the blog posts going out? Who is going to review the sales strategy with your sales team? So every big company and small company has all these little projects where you have to maybe review certain things in there. And maybe your team’s big enough where you don’t have to do that anymore, but you wanna make sure you’re activating your team fully. The third thing that you have to face with this is which ones are making money and which ones aren’t? Which ones are really allowing you to grow the business, and which ones are you just keeping on because they’re there, or because it’s what you’ve always done? You’ve also gotta figure out really how you wanna play a role in this. Are you the visionary, or are you the person who’s executing on all of this work and working with the teams? It’s really hard to play both roles in growing your company. I’ve seen this across many companies. There’s lots of companies that really have a separate role for the execution of the projects and whatnot, and the visionary who’s out there, the face of the company, and making other things happen. So this little time bubble exercise will give you some insight into where your energy is going into. And if you’re feeling overwhelm, I suggest that you do this. Just take a little bit of time to see where you are right now. And then look at it. Let it kind of simmer over a day or two, and if you have questions about what you’re facing and how you’re gonna grow forward, it may be hard to make those decisions on your own. If you wanna have a quick conversation about it, let’s get to know each other. I’d love to talk to you. Just reach out to me at [email protected], and I do wanna hear back from you. If you actually are doing this time bubble exercise, and your map looks similar to mine, then you might wanna talk to me because I’ve been through this not only with myself, but also my clients. And so this is just one exercise that you can do to get a better understanding of the overwhelm in your life. And you can make some, see what your choices are so that you can make some strong decisions about how you wanna move forward. As always, lead with courage, and I’ll see you next time.